Area : 15 sq. km. Temperature : Max. 27°C to 43°C in Summer. Min. 10°C to 26°C in Winter. Best Season : August to March. Bajada Rao founded the district in 13th century. A tiny yet lively town in Sun-drenched sands, Barmer is a miniature Rajasthan with all its colour, Warmkh and tradition. Barmer is known for its rich crafts, dances and music. Once on the ancient camel trade route, the town is now the centre for woodcarving, pottery, carpets, intricate embroidery work, block printed fabrics and multi-hued traditional costumes. The most interesting part of a trip to Barmer is the journey through rural Rajasthan. Every year in March the desert town becomes colourful during Barmer festivals. Air: Nearest airport is Jodhpur. Rail: Nearest railhead is Jodhpur. Road: Barmer is well connected by good bus service with all major cities in the state. The Town: Perched on a rocky hill, the town has ruins of an old fort. An ancient ruin of Juna Barmer, a temple dedicated to Sun God, three Jain temples with an inscription of 1295 A.D. and the largest temple with a massive pillar of Maharaja Kula, a ruler of Barmer are worth visiting. Jasol: Once a principal state of Mallani, this ancient village has got its name from the descendants of a Rathore sub-clan. A Jain temple and a Hindu temple are worth visiting. This Hindu temple is ornamented with fine sculptures. Meva Nagar: This 12th century village lies on the slop of a hill called “Nagar-Kite-Bhakarian”. The village has three Jain temples. A Vishnu temple is also a worth visiting. Mahavir Park: Mahavir Park is beautifully laid out park with a tiny museum housing ancient stone-carved statues. Safed Akhara: This is a tiny yet pretty garden near Barmer. Temporary accommodation and cooking facilities are available. Man Mahal: Former residence of Raja Man Singh of Amer, has been converted to RTDC Sarovar Tourist Bungalow ensuring convenient accommodation to the travellers. Khed: Rao Siha, the founder of the Rathore class along with his son (Asthanji) conquered Khed from the Guhil Rajputs and planted the standard of the Rathores. An old Vishnu temple of Ranchhrji is surrounded by a crumbling wall and an image of Garuda (the eagle) at the gate guards the complex. Other temples nearby include temples of Brahma, Bhairav, Mahadev and a Jain temple. 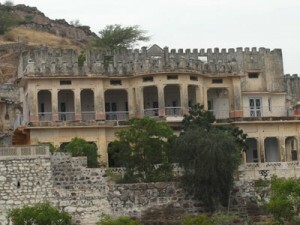 Neemari: Neemari is another picturesque garden on Chohatan route, just 23 km away from Barmer. An old swimming is an attraction. This entry was posted in Barmer, Rajasthan and tagged barmer map, barmer tourism, barmer weather. Bookmark the permalink.